We install about just every lock. a car lock, safe, business / office lock, home lock, front door / entry door lock. We install all types of locks including deadbolts, electronic smart locks, high security locks, knob levers, lever handle locks, mortise locks, cabinet locks and more. As part of the installation service we offer also the new lock itself, so even if you don’t have the new lock already, we can bring your new lock with us! Deadbolts: A lock that can only be moved or opened by rotating the lock cylinder with the key. Electronic Smart Locks: Offers security and flexibility allowing you to access and control the safety of your home through your phone. 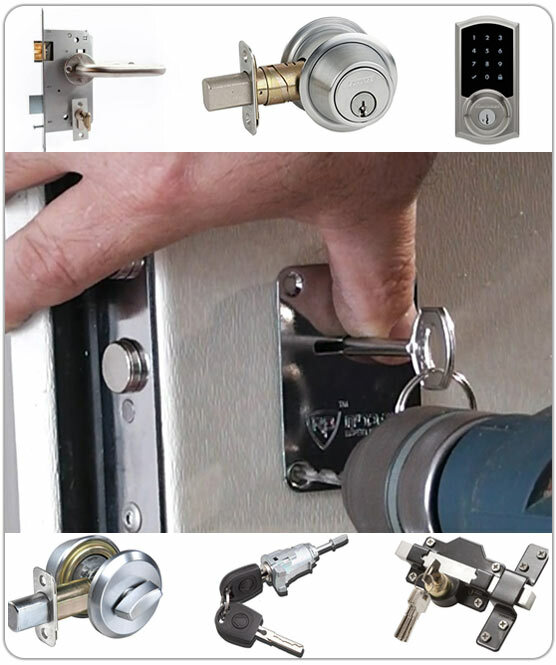 This type of lock installation is not only easy to control but easier to install. Key Pad Locks: Instead of needing a key to open the lock you’d need a code. The key pad guarantees safety to your home or company. If you’re in a rush no need to worry about closing and locking the door behind you it automatically does it itself! Before deciding whether you want a new lock installation or if you want to stick to the same one you should consider a couple of things. Why should I install a new lock? For you to feel secure in your home or office you should consider a solid new lock installation. With an out of date lock or rusted non-working locks there is no way of knowing weather your office or home are out of dangers way. Safety for a home or office all starts with your door locks. Lock installations are available, including deadbolts, electronic smart locks, key pads and magnetic locks, for residential, commercial, or industrial applications. Our prices depend on the type of lock you may have and the type of lock you are having it replaced with. So, it all depends on the type of job our tech is being brought up against. Once our technician is on sight, he will access your situation and let you know of the services you will be needing as well as the price. For any questions, concerns, lock installation services, or any locksmith services feel free to call (866)550-Lock(5625) and get a technician sent out to you immediately.